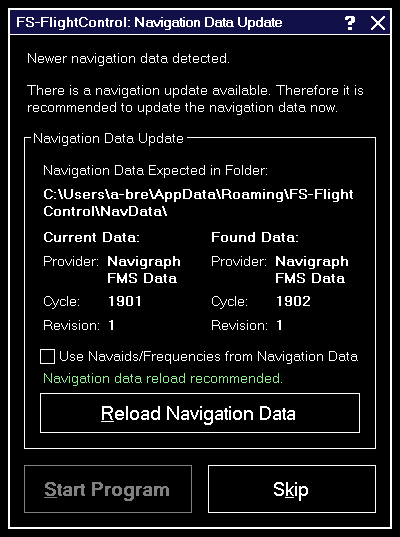 The navigation data update dialog informs you about a new AIRAC data cycle that you can import to FS-FlightControl to have up-to-date waypoints and airways. 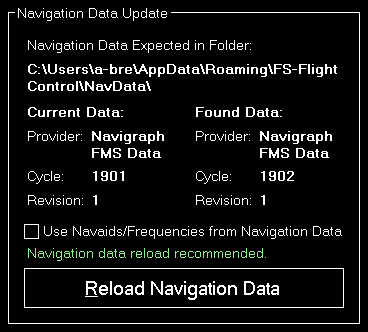 Both Aerosoft with NavDataPro as well as Navigraph with FMS Data provide AIRAC data updates for FS-FlightControl. Note: This separate navigation data update is only required for Prepar3D, FSX and FSW. For X-Plane please just start a new database build after you have updated the X-Plane internal navigation database. This section shows the current and new data provider as well as some information about the data cycles involved. It is recommended that you reload the navigation data whenever an update is available to always work with the latest waypoints and airways in FS-FlightControl. In this section we want to provide you with some information about which part of the AIRAC data is currently imported and used by FS-FlightControl. Currently only waypoints, airways as well as SID and STAR procedures are imported from the AIRAC data, but no airports and navaids. Also frequencies are not updated based on the AIRAC data. The reason for this is that it just makes no sense if you see for example a new runway of an airport in FS-FlightControl, because this is imported from the AIRAC data, but this new runway just is not present in flight simulator itself. Same goes for the frequencies: An ILS frequency will only work correctly if flight simulator knows about exactly this frequency. Therefore it is important that you see in FS-FlightControl the same frequency that also flight simulator uses - also if this might be outdated. We recommend to keep the flight simulator data itself as up-to-date as possible. You can do so by getting new sceneries for airports and regions you are mainly flying. But there are also free tools to update frequencies in flight simulator, for example on this website. Note: Please keep in mind that you always need to start a database rebuild in FS-FlightControl after you did changes to your flight simulator data.